Constant innovation is vital to survive as a business in the highly dynamic environments of today. Legacy businesses especially are sometimes too static and complex to react to continuous change. Pushing innovation just for the sake of it won’t do the trick either. Organizations need to focus on the customer, their needs and pain points to deliver innovations and products that make an impact and will help companies to stay relevant. So how can legacy businesses break out of their bureaucratic habits which are slowing them down and enable themselves to prepare for the future? We at LHBS believe that becoming more Agile is the best way to cope with an increasingly volatile, uncertain and complex world. Agile helps businesses to accelerate profitable growth by taking people out of their functional silos and putting them into interdisciplinary and customer-focused teams. These self-organizing teams will focus on publishing incomplete versions of products, getting feedback, then learning and improving from this. As a result, they are making the necessary changes to deliver customers what they need, rather than what a product manager (an organization) thinks they want. The idea is to get rid of year-long projects developing services that no consumer desires or endless product development circles producing products that are outdated before they’re even on the market. Compared to classic waterfall approaches, Agile organizations profit from interdisciplinary cooperation and iterative improvements that allow them to be closer to the customer and quicker into the market. Constantly providing new value for customers and upgrading offerings continuously is the main driving force behind Agile’s self-organizing teams and iterative process. Agile will therefore help businesses to innovate and deliver customer-centric offers in an instant and intimate way. At the same time reducing time to market and empowering and motivating employees. First of all Agile is a set of values and principles and not a methodology per se. Agile follows a collection of beliefs with all approaches and working styles underlying them. While there are more than 40 different Agile practices, our experience at LHBS has demonstrated a combination of Scrum, Lean and Design Sprint works best with legacy organizations. That’s why this article will focus on explaining them closer here. Scrum, Lean and Design Sprint are combined to facilitate a time boxed process of exploring customer behavior, innovation and business strategy by building prototypes in interdisciplinary teams and testing them with real users. These practices are all iterative in their approach and require adopters to develop insights to constantly evaluate and adapt findings. When combined, these three practices help you figure out what work to do (Design Sprint), how to do the work (Scrum) and how to do the work most efficiently (Lean). The agile pilot is thereby amplifying the innovation process. It is crucial that the different terminologies are explained when first thinking about Agile in an organizational context. This sounds obvious, but particularly with buzzwords like Agile, Scrum and Design Thinking being hyped in the popular media means there are many different understandings in circulation. This leads to confusion and biased opinions about the topics. It is crucial for Agile that there is a common understanding through the whole organization on how to use these frameworks and on how they best fit the peculiarities of the organization. HOW DOES AN AGILE PILOT WORK? the Project owners are happy because they can make changes during the project. Following this Agile approach, work will happen in recurring sprint intervals. Independently executed from the self-organized interdisciplinary teams to achieve shorter cycles, the workload is split into relatively small tasks and continuous feedback from customers will be collected to deliver the desired output. 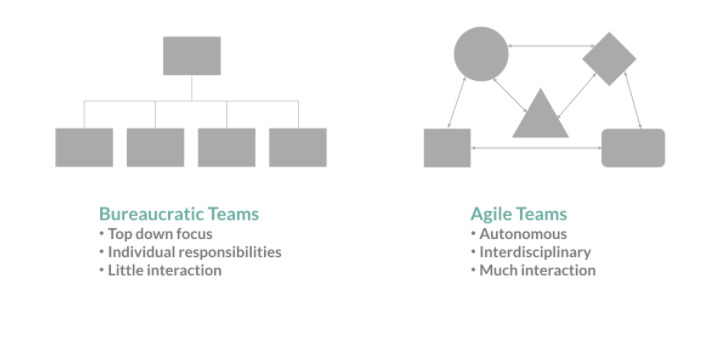 To fully reap the benefits of being Agile, the organization needs to change as a whole. Managers need to embody the Agile mindset and all must understand that becoming Agile is a process that has no predefined ending. Today, having quick access to insights is a top priority for every innovation department in any industry. Most innovation departments already have a system in place to craft, test and implement innovative ideas. But where do those ideas come from? LHBS conducted a study on how companies collect, save and share valuable insights among team members. This global study, held in November 2015, was based on a survey distributed to 100 participants, both clients and service providers, including agencies and consultancies. The results are presented in this report. The Business Model Canvas represents a valuable framework which is used by many small and big organizations all over the globe. With its flexible yet simple application, it has helped many companies to improve existing products, create new ones, and develop better strategies for the future. When we work with clients, whether it is building up on and developing existing ideas, or completely innovating a business model, the canvas is one of the most used tools here at LHBS. Interestingly enough, despite most managers being aware of the canvas and with the vast amount of information about business modeling online— many organization still struggle and encounter difficulties in applying the Business Model Canvas to their company. In order to solve the most commonly addressed issues, we have dedicated this installment of our ToolBox series to the Business Model Canvas. The ToolBox is a practical guide of the WHY, the WHAT and the HOW of business modeling— and aims to highlight and explain the most important aspects about the business development tool. If you would like to learn more about the Business Model Canvas and its application, please feel free to get in touch with us. We also offer Business Modeling as well as Business Model Innovation Workshops, where we create new businesses and reinvent existing ones. Innovation is not only confined to newest technologies or R&D. It is a process crucial to every business; it’s an initiative that can solve complex problems, as well as help to take advantage of emerging opportunities. Businesses that fail to innovate, are operating inefficiently and will be at risk of losing their competitive advantage. The CEO’s are fully aware of it, in fact 97% of them say that innovation is a top priority for their business (PwC Pulse Survey). It is included in strategies, talked about during numerous meetings— but often the priority gets lost amongst daily operations. In effect, innovation is a difficult process to jumpstart, execute and follow through. We believe, that solid knowledge requires continuous discovery and innovation requires continuous inspiration. We have draw up a toolbox that guides businesses on where, and how, to look for innovation— along with inspiration that comes from real insights, solutions coming from an actual “need,” and that respond to different external or internal factors. Building on an excellent article from Harvard Business Review, we have elaborated on the basic principles to make it more actionable and easier for businesses to execute on. Please explore the full toolbox below. If you would like to learn more about which of these innovation insights can help your organization to respond to current challenges and how take advantage of emerging opportunities, please get in touch with us. We offer an Innovation Insights Workshop to explore opportunities, as well as complete Innovation Engagements— from Research, Ideation to Prototyping. In the wake of the financial crisis and the digital disruption of legacy business over the last five years, innovation stands out as a top priority for every company. Driving this disruption of traditional business are two factors: the rise of digital (companies like Google, Facebook and Uber) and aggressive global expansion of Chinese companies (such as Alibaba, Xiaomi and Tencent). While a lot of companies are increasing their innovation and R&D budgets to defend and expand their business, exactly how budgets get turned into new products, services and business models often remains a black box. A recent article in strategy+business, ‘Proven Paths to Innovation Success,’ not only sheds some light on the black box of innovation concepts, but also strengthens our own innovation approach at LHBS. such as Procter and Gamble, are companies that gain insights through direct customer engagement. They learn from interaction in real world environments using ethnographic research techniques, as well as their extensive use of digital market research opportunities. They aim to identify unstated customer needs of the future and develop new products and services based on those needs. Need Seekers are typically first movers who open new markets and segments, and work in a culture that encourages openness and collaboration. like Samsung, are companies that focus on creating value for customers via incremental innovations of already proven market concepts. In order to understand the underlying dynamics of future demand, the core activity for market readers is to generate insights by closely monitoring their markets, customers, and competition. Market readers are usually second movers who put less emphasis on the collection of direct insights. They work in a culture that emphasizes operational excellence in managing resources and capabilities between geographies, suppliers and partners. such as Google, depend heavily on their internal technological capabilities to develop new products and services. They leverage their innovation budgets to drive both breakthrough innovation and incremental change. Technology Drivers work under the assumption that they will naturally meet the known and unknown needs of their customers and, when needed, adjust their products and services on the go. Their work environment is typically focused around technological knowledge and talent management. In a recent study, Strategy& identified that Need Seekers usually have a higher alignment between their business and innovation strategy than both Market Readers and Technology Drivers. As shown in the table above, a key outcome of the study is that the percentage of Need Seekers who financially outperform their competitors is the highest among the three types of innovation approaches. This study also underlines our experience with innovation projects for FT Global 500 clients across industries. Depending on the specific challenge and the project’s context, we provide either new insights into consumers via approaches used by Need Seekers, or incremental innovation opportunities through the close business and technology monitoring of Market Readers. Through the combination of ethnographic research and our Inspiration-Hub, we deliver a more holistic, timely view on emerging business opportunities.